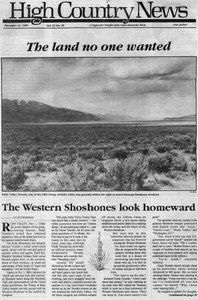 The Western Shoshone look homeward to Ruby Valley, Nevada. Montana's largest hunting organization has joined animal-rights activists and conservationists in condemning the state's hunt on bison leaving Yellowstone National Park this winter. Zortman Mining Co., a wholly-owned subsidiary of Pegasus Gold Inc., recently proposed and won approval of a major expansion at its mine in the Little Rocky Mountains.